Chimera R, Other CD & Sound Bank from 9 Soundware. Chimera R is a set of patches for the Redrum drum sampler within Propellerhead Reason. The theme of the sound set is hybridism. Its origins are in five previously released 9 Soundware titles. The drum kits are based on samples from the Heartbeat and Concussion EXS24 sound sets, as well as patches from the Fire Juggler, Vortex, and Ax releases for the Thor, Malström, and Subtractor synthesizers, respectively. "Human/synthesis hybrid. The idea behind this category is the transformation of recordings of the human heart and other internal organs with signal processing. These Redrum kits are based on 100 samples. They are based on audio which was captured using an electronic stethoscope, which is more sensitive and capable of capturing quieter sounds compared to acoustic stethoscopes. This category consists of 10 Redrum kits. 199 samples from the multisample instruments of Heartbeat that have not been mapped in these patches are also included." "Found object collisions. This category is based on acoustic impact sounds created entirely with found objects. These Redrum kits were constructed from samples of objects being struck, thrown, dropped, and manipulated in a variety of other ways. Among the items used in the recordings are sheet metal, furniture, auto parts, a flyswatter, chains, mousetraps, pipes, and a cardboard box. Examples include the sounds of a large piece of sheet metal being struck with a metal rod, furniture being slammed against the studio wall, a small chain being dropped onto a paint roller tray, and air produced from flinging a stick. This category consists of 10 Redrum kits. 94 samples from the Concussion multisample instrument that have not been mapped in these patches are also included." 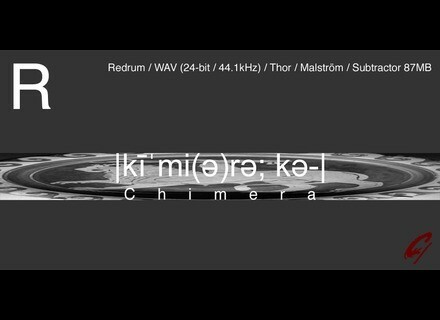 "The Synthetic category consists of Redrum kits that feature resampled drum patches from the Fire Juggler, Vortex, and Ax sound sets (for Thor, Malström, and Subtractor, respectively). The sub categories of drum kit components emulated by the patches include Bass Drum, Snare Drum, Hi-Hat (Closed, Open, and Pedal), Tom, Crash Cymbal, Ride Cymbal, Side Stick, and Hand Clap. With the exception of the Tom patches, which were recorded at four separate pitches, one note was resampled for each patch. This category consists of 20 Redrum kits. All100 synthesizer patches (40 .thor, 30 .xwv, and 30 .zyp files) are also included." "The Chimera Redrum kits combine samples from the Human Heartbeats, Found Objects, and Synthetic categories. These patches also feature sample playback manipulation. This category consists of 10 Redrum kits." 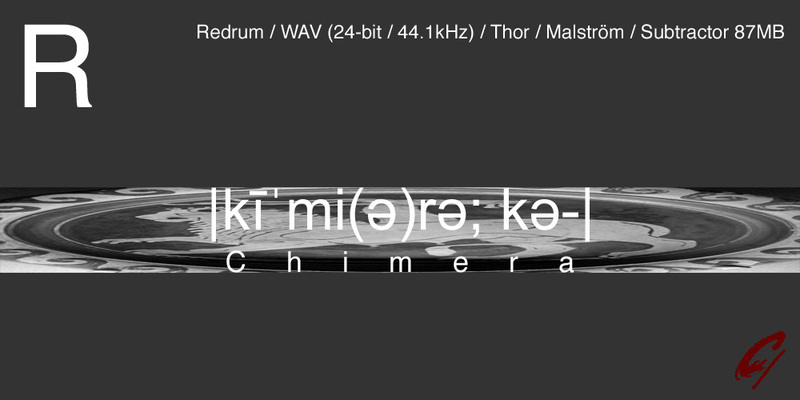 The 50 Redrum kits of Chimera R are based on 309 samples. Included are 293 samples from the Heartbeat and Concussion sound sets that have not been mapped in these patches. The 87 MB download includes 50 .drp files, 602 WAV files (24-bit/44.1kHz), 40 .thor files, 30 .xwv files, and 30 .zyp files. Chimera R is available now for $49.99 at www.9soundware.com. True Essence - Drums Inspired by DJ Premier Consisting of 348 drum samples this sample pack is broken down into the three major drum sample elements: 116 kicks, 116 snares and 116 hi hats. Sinevibes (Already) Updates Turbo Sinevibes has updated its Turbo plug-in to version 1.0.1 and announced the release of two new titles in its sample collection series. Tascam Portastudio for iPad Tascam's Portastudio App for iPad is based on the Porta One recorder and can record up to four tracks with "a vintage vibe."